Yummy Bazaar Reviews - Taste Food from Around The World? Yummy Bazaar with a global food store and subscription company that offers customers access to premium international foods that are difficult to find stateside. Yummy Bazaar Review: Taste Food from Around The World? Yummy Bazaar is an online shopping destination and subscription service where you can buy gourmet food from around the world. According to the company website, they offer a curated collection of premium food products for individual purchase or through subscription boxes. The company states that they take extreme care to source only the highest quality products for their customers, but is this what actually happens? We looked closer at what the company offers and how it compares to the competition to get the facts straight. What Options are Available for Yummy Bazaar? At the time of writing, Yummy Bazaar offered an online store of select international food items from France, Italy, Germany, Spain, Scandinavia, Japan, Korea, Southeast Asia, the United States, Columbia, and Turkey. They also offered two subscription boxes: a ‘Full Experience’ box with 6-8 full-sized items from one or more countries that are typically based on a theme, and a ‘ World Sampler’ box with 5-6 sample-sized products from a variety of countries. How Does the Yummy Bazaar subscription process work? When you choose to gift or receive a Yummy Bazaar subscription box, you first must select which variety you want and how many months you want to commit to. Both the Full Experience and Sampler boxes are available for a one-time purchase as well as three-month, six-month, and twelve-month subscriptions. At the time of writing, the Full Experience box cost $35.95 per month and the World Sampler was priced at $9.95 per month. There isn’t a discount for buying a longer subscription – each month costs this base price. Gift subscriptions are available for any length of time, and they won’t auto-renew after expiration like the company’s standard subscriptions. All Yummy Bazaar orders are shipped out between the 15 and 18th of every month, and the company states that they should arrive within 2-4 days. The brand offers free shipping for all orders over $49, and they charge a flat rate of $5.95 for ground shipping everything else. What is the Yummy Bazaar Return Policy? Yummy Bazaar’s terms and conditions state that they will refund any products you aren’t satisfied with so long as you return them to the company unopened within 30 days of the sale date. Any opened products are considered used and aren’t eligible for return. Damaged and lost products should be reported to the company within 48 days of delivery to qualify for a refund. You can contact the company directly with specific questions at 1 (844) 986-6922 or through their contact page. At the time of writing, Yummy Bazaar offered a free loyalty program for all registered customers. Every dollar spent on food products or a subscription (shipping and taxes excluded) earns one point, and new members automatically receive 99 points. You can also send the company an email to gain points for past purchases that you didn’t redeem. What Kind of Foods Come with a Yummy Bazaar Subscription? Both Yummy Bazaar subscription packages (Full Experience and Sampler) offer a standardized collection of gourmet food products, meaning that each subscriber will receive the same products each month. What types of food are you likely to receive? We looked at what was inside the December 2018 boxes to give you an idea. Most Full Experience boxes are based around a theme, which is often a country or world region. At the time of writing, the month’s box was a holiday theme and included the following full-sized items from Germany, Spain, Italy, and Sweden. Schlünder Stollen: A stollen is a traditional holiday cake with candied fruit and coated in a thin layer of icing. This mini version is made by a 430-year-old German confectionery company and meant to be the final course for a holiday meal. Lambertz Cinnamon Stars: These German cookies have a crumbly texture and a hint of spice paired with the icing. Tre Marie Panettone: Tre Marie has produced this classic Italian holiday cake since 1150, and its complex baking process requires three dough types and three days of rising to create a yeasty, fruit-filled dessert. Black Truffle Chips: These Spanish potato chips have a strong truffle taste that makes them more decadent than standard options. Christmas Soda: A lightly-sweetened drink from Sweden, this Christmas soda is caffeine free and has a slight hoppy taste. Spanish Artisanal Marshmallow: Designed to look like a lollipop, these marshmallows come in a variety of holiday-themed shapes like Santa and snowmen. Motta Panettone: This mini panettone comes from Italy and offers a yeasty sweet with raisins and candied fruits within it. French Hot Chocolate: This classic French cocoa powder provides a fruity, vanilla-scented blend for brewing your own cup of hot chocolate. Sparkling Potato Chips: Reminiscent of wine, these Spanish potato chips are a different take on a classic favorite. From what we could tell, all products provided in Yummy Bazaar’s subscription boxes are also sold through the company’s store, so it’s possible to rebuy your favorites from each order. What Do Previous Customers Think of Yummy Bazaar? Do previous customers appreciate their Yummy Bazaar subscription packages? We looked through reviews both on the company website and other online sites to get a sense of the consensus. From what we read, Yummy Bazaar customers are impressed overall with the company. Many noted that their orders came faster than expected and that each potentially fragile item was packaged securely so that there wasn’t any damage from shipping. In regards to the value of each box, one reviewer who received a Greek-themed box noted that the total cost of each item within it was $37.10, which was about one dollar more than the purchase price of $35.95. Since she didn’t enjoy every product within the box, she questioned whether the subscription was worthwhile and concluded she should buy foods she knows she’d like from the site instead. The Yummy Bazaar website allows customers to rate each product they receive, and one reviewer took issue with that because her three-star review of a food product was seemingly never posted. This led her to speculate that the company was only publishing positive reviews and that they weren’t an accurate representation of how customers really felt. Overall, we found through these reviews that customers seemed satisfied with the quality of most of the products they tried from Yummy Bazaar. However, because the company didn’t offer much of a discount on the items within their subscription boxes, not liking one or more products will make the subscription more expensive than just buying what you want. What Brands are Similar to Yummy Bazaar? Yummy Bazaar is just one of several discovery commerce companies that offer subscription products, so we developed this chart to compare some key characteristic between a few of the popular ones. Types of Snacks International snacks with a monthly country theme Gourmet sweet, salty, sour, and savory snacks from around the world. Healthy snacks free of artificial ingredients. Dried fruit, granola bars, chips and crackers, etc. Low-calorie, high protein, or traditional healthy foods like nuts, dips, crackers, dried fruit, and more. Shipping Costs $5.95, free for orders over $49 Free in the U.S. $4.95, free for orders over $25 Free in the U.S. Looking at these details, the data indicates that Yummy Bazaar is after a different demographic than NatureBox or Graze. Those companies both offer brand-specific snacks that are meant to be a healthier option than what you typically find in vending machines. While a few of these snacks might have an international flare, they are branded as a tasty fuel source. Yummy Bazaar and MunchPak, however, both offer a variety of international snacks that are produced by independent brands. There’s significant overlap between some of the product offerings between the two companies, as both offer brands like Haribo, Cadbury, Pocky and more. Regarding their subscription value, Yummy Bazaar costs $10 more per box than MunchPak, but it only offers full-sized products, while MunchPak only guarantees each product weighs more than 0.2 ounces. Another difference is that Yummy Bazaar subscriptions typically include cooking ingredients like risotto, tahini, or tinned squid while MunchPak puts the focus on ready to eat snacks. One thing to consider between the two brands is their level of customization (or lack thereof). MunchPak allows subscribers to specify whether they want more of certain types of snacks (such as fruity, salty, nuts-based and more) for an extra cost, while Yummy Bazaar sends the same monthly box to each subscriber. This could potentially be a problem for picky eaters and those with allergies. 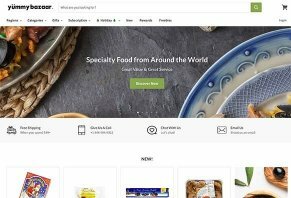 Overall, we think that a Yummy Bazaar subscription makes the most sense for those who want an immersive global taste experience that requires them to interact with the food in their kitchen. MunchPak, in contrast, is better if you want to gain access to the snack options like you would find in an international convenience store. Our View: Should You Try Yummy Bazaar? With these facts in mind, do we think it’s worth subscribing to Yummy Bazaar? That depends on what you’re looking for. Overall, we think Yummy Bazaar offers a comprehensive collection of products from around the world. The Full Experience boxes are themed, which makes them a more immersive culinary experience than other subscription brands like MunchPak are offering. However, having set contents within each box means that there’s no room for customization, and allergy sufferers might be out of luck. Value seekers might want to look elsewhere, as the brand doesn’t offer discounts per box for signing up for a longer subscription, and the value of all included products in each box might not be much different from buying them individually. However, the brand does offer a free loyalty program that provides discounts to shoppers. Customer reviews we found for the brand are primarily positive, though one subscriber commented that her lukewarm review never went live on the site. If you’re interested in trying Yummy Bazaar but aren’t sure if you want to commit for the long term, consider signing up for a single box. The price isn’t different for one month than for longer subscriptions, and you won’t be locked into a subscription if it’s not for you. Write a Review for Yummy Bazaar!